With Rudy Gay still out of the lineup for the Sacramento Kings with a left Achilles injury, I thought it would be appropriate to cover kinesiotaping strategies for this important tendon. A study titled “Calcaneal loading during walking and running” published in the Medicine & Science in Sports & Exercise in 2000 showed that the Achilles tendon can have load forces of up to 3.9 times your body weight when walking and 7.7 times body weight when running. Thus, it is important to help support and stabilize it especially during high impact activities such as running, volleyball, and basketball. Below is an excellent way to apply kinesiotape on the Achilles tendon, courtesy of KT Tape. Sacramento Kings F Rudy Gay was diagnosed with a strained left Achilles tendon after undergoing an MRI on Thursday. Gay sustained the injury in Wednesday night’s game against the Houston Rockets in the first quarter after driving into the lane and scoring on a floater. He is listed as day-to-day and was spotted in a walking boot today. The Achilles tendon attaches the calf muscles to the heel bone (calcaneus) and is often injured with overuse, especially running and jumping. 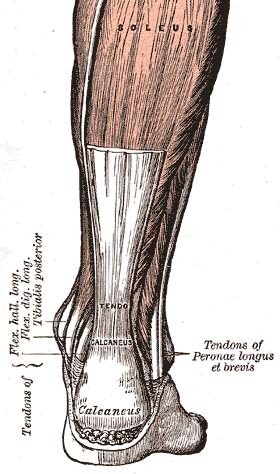 Chronic Achilles tendonitis can cause weakening of the tendon and lead to a rupture. A torn Achilles tendon can heal on its own over time but many doctors recommend surgery. Even then, rehabilitation of the area can take 4-6 months before returning to regular levels of activity. For Achilles tendonitis or strains, the usual RICE (rest, ice, compression, elevation) protocol is the standard guideline to follow, along with the use of a walking boot to help stabilize the tendon. In addition, therapeutic ultrasound and transcutaneous electric nerve stimulation (TENS) may help the healing process. After only eclipsing the 30 minute mark once in the last 6 games, Derrick Williams played 40 minutes for the Kings after Gay left the game. Williams responded with his first double-double of the season (22 PTS, 11 REB). Should Gay be out longer than expected, Williams looks to be a good pickup.